The Ebonheart Pact is one of the three joinable factions participating in the Alliance War, the other two being the Daggerfall Covenant and the Aldmeri Dominion. The crest of the Ebonheart Pact is a dragon, and its colors are red and black. It consists of four of the five Dunmer Great Houses of Morrowind, the Nordic kingdom of Eastern Skyrim and the Argonian tribes of northern Black Marsh. The alliance was reluctantly formed out of necessity; despite the three races' ancestral hatred for each other, they recognized the threat posed by their unified enemies, both at home and from across the sea, and banded together to protect their borders and freedom. Led by Jorunn the Skald-King, who presides over the Great Moot in the Pact's capital of Mournhold, the alliance seeks to defeat the corrupt Empire and preserve the independence of its homelands. Pact players will begin on Bleakrock Isle after being washed up unconscious on the shores of the island following their escape from Molag Bal's realm of Coldharbour. The Great Houses hold a lot of power in Morrowind. All but House Telvanni agreed to join the Pact, and the Telvanni have now become somewhat estranged from the other houses because of it. Black Marsh has no monarchy, but certain Saxhleel tribes joined the Pact to protect their interests. 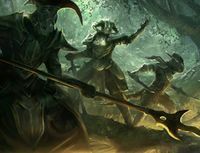 Under the terms of the Alliance, slavery was nominally outlawed; but House Dres was allowed to keep non-Argonian slaves, with Khajiit being the most common race currently enslaved. All Argonian slaves were released. 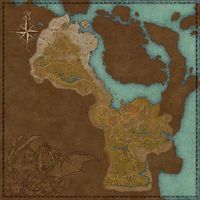 The Ebonheart Pact's home territory covers Eastern Skyrim and parts of the traditional provinces of Morrowind and Black Marsh. The Pact also have a territorial claim over the eastern and northeastern parts of the Imperial heartlands. Ebonheart Territory — The northeastern region of Cyrodiil. Quests with this marker are required for Cadwell's Almanac. For a full list of Almanac objectives, including any required side quests, please see Cadwell's Almanac: Ebonheart Pact.